President of the University inaugurates the sports season with the starting technology championship of football for students. 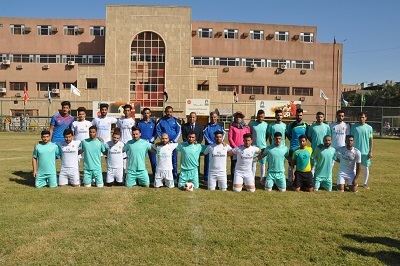 President of the University of Technology Prof. Amin Douai Thamer inaugurates the new sports season 2017-2018 with the starting of the university's championship of football for students, in the stadium of the university on Tuesday, the thirteenth of November 2017 with the participation of sixteen teams representing the scientific and engineering departments and the presence of a number of heads of engineering departments. 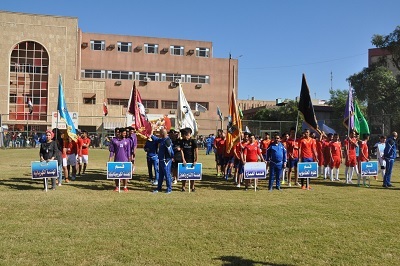 The opening begins with a review of participating teams in the championship, and then say the championship's swear, then the President of the University allows opening of the competitions, indicating in a speech the importance of sport and its distinctive role for the Iraqi people, It has its status at the university level indicating that the university presidency supports the establishment of various student activities, including sports and various games. The mechanical engineering team began in the championship with a big victory verses the oil technology team with six goals without a response in the game played on the university stadium within the first group. The players rotate to score the winning goals Ali Assad "3 goals", Hallo Ghazi "2 goals" and Mostafa Hadi one goal only. In the second match in the same group, the chemical engineering team wins over the team of laser engineering and optical electronics with three goals to two goals. Assist.Prof.D. Najah Salman the director of department of student activities at the University of Technology says: the first part of the sports season will include many sports championships starting with football competitions, which were distributed to the 16 teams participating in four groups, the first group includes teams of: the previous title holder mechanical engineering departments, Laser and Optoelectronics Engineering, Chemical Engineering and Petroleum Technology Department. The second group includes teams of Department of: Electrical Engineering, Electromechanical Engineering, Communication Engineering and Control and Systems Engineering Department. The third group includes teams of Department of :Production Engineering and Metallurgy, Materials Engineering, Computer Engineering and Computer Engineering. The fourth group includes teams of Department of: Building and Construction Engineering, Architectural Engineering, Biomedical Engineering and Computer Sciences. The mechanical engineering team was crowned with University championship title Football for students After its winning on the Department of Electrical Engineering four goals against one goal in the final of the last season.